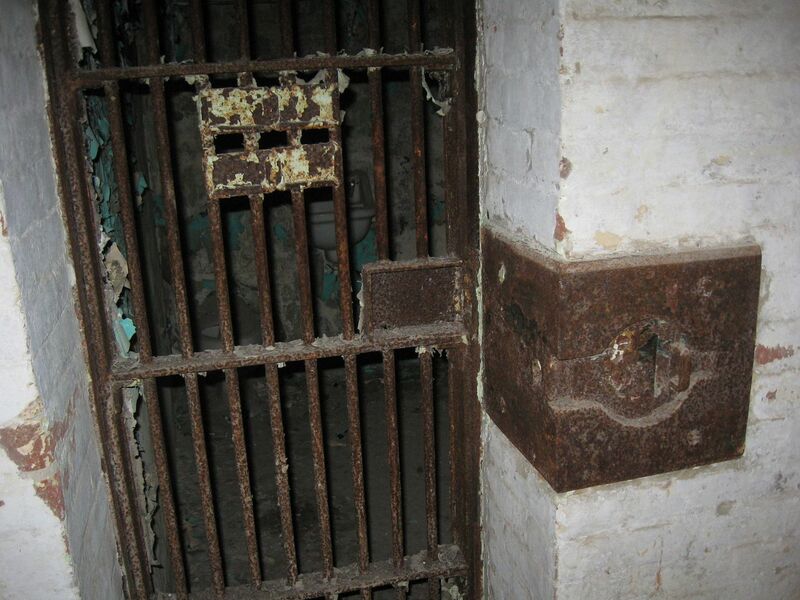 2013 Road Trip Photos #33: the Three Investigators and the Case of the Abandoned Prison « Midlife Crisis Crossover! Day Nine was the final leg of our journey, from the fair city of Cleveland to our hometown of Indianapolis. By this time my wife, my son, and I were ready to finish our gallivanting, return home, climb back into our own sleeping quarters, and swear off free hotel breakfasts for the rest of the summer. A man can only ingest so many stale mini-muffins before madness begins to creep in at the edges. But it wouldn’t be our kind of road trip if we let a single pass without at least one stop along the way. Fortunately we found just the place to unwind, wander around, stretch our legs, clear our heads, broaden our horizons, and imagine how daily living might look if we walked in the shoes of another man completely unlike ourselves. 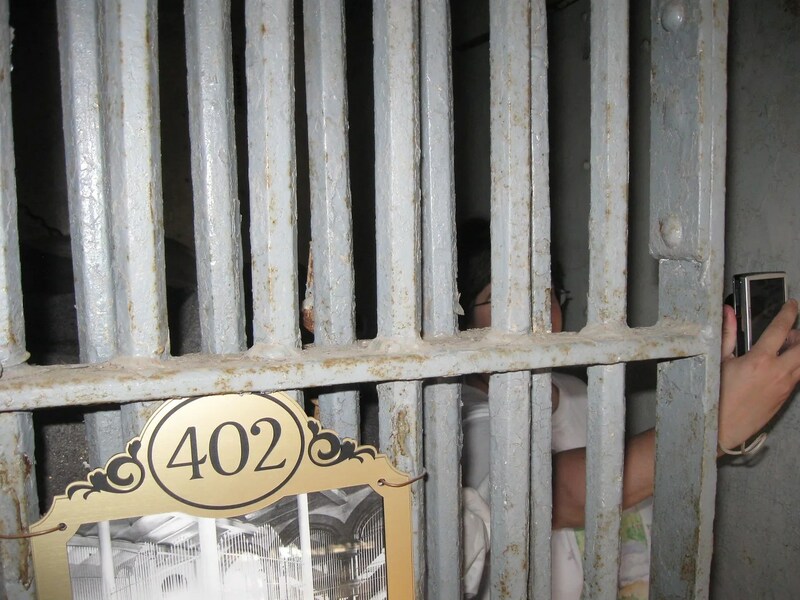 So we went to prison. 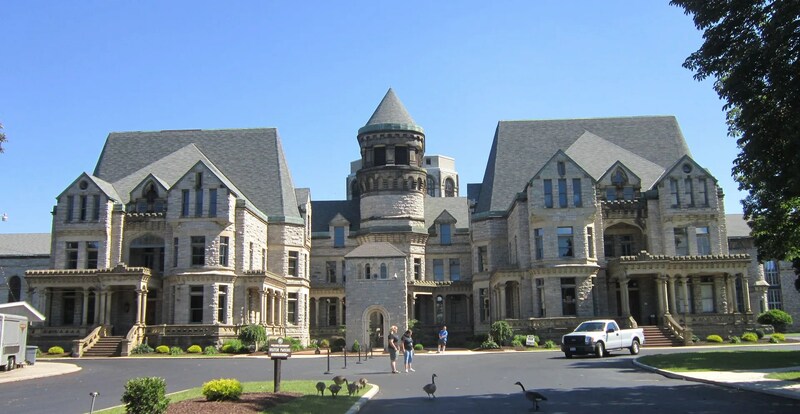 The town of Mansfield is home to the Ohio State Reformatory, a former prison from 1896 to 1990. Though it was abandoned for a time, tourists are now allowed to walk through most of it on a carefully preset path. I wrote previously about its history on the evening we returned home. 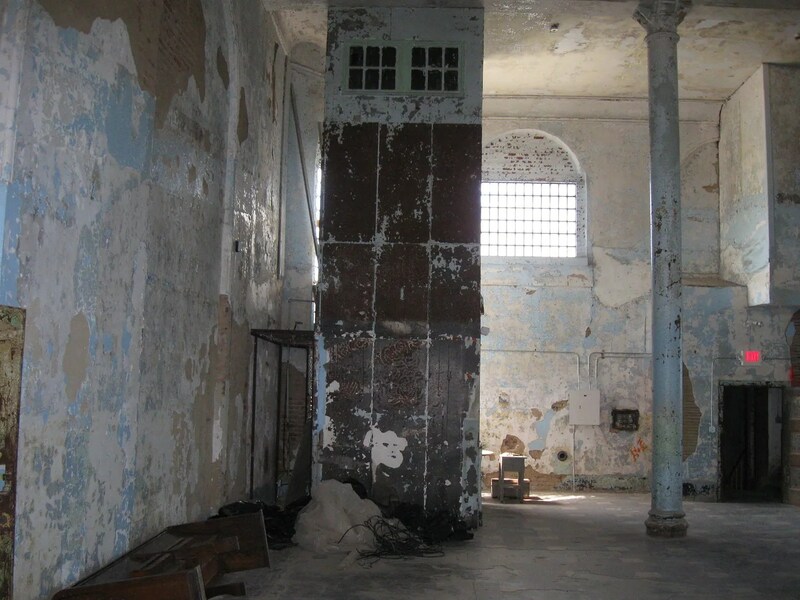 The descriptions in that entry remain valid, especially the part where I name-checked movies that had scenes filmed here in the past, such as The Shawshank Redemption. This wasn’t our first time visiting stabilized ruins. 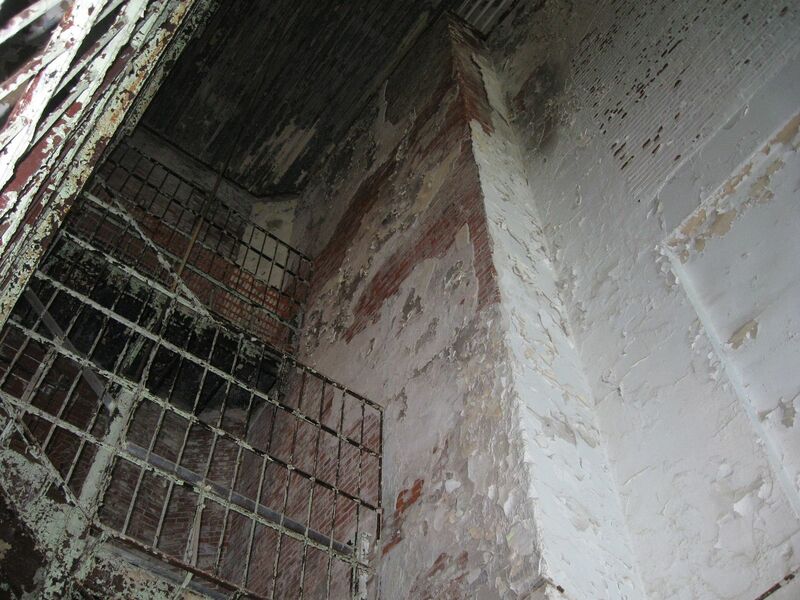 Our 2010 road trip included a tour of Philadelphia’s Eastern State Penitentiary. 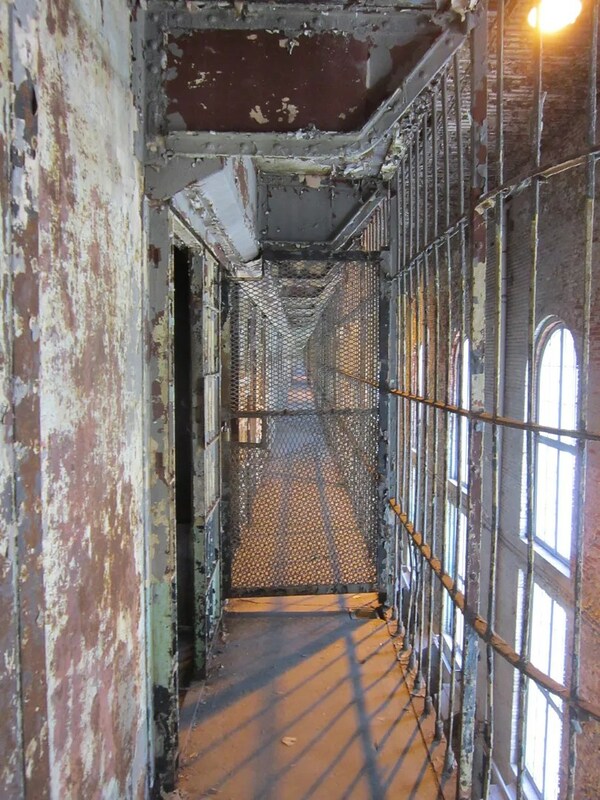 The Ohio State Reformatory was smaller but no less fascinating to me, as we walked through its echoing, creepy halls. Not every area is open to tourists. It’s not because we didn’t pay for a group tour or deluxe admission, but because some areas simply aren’t safe for civilian traipsing. 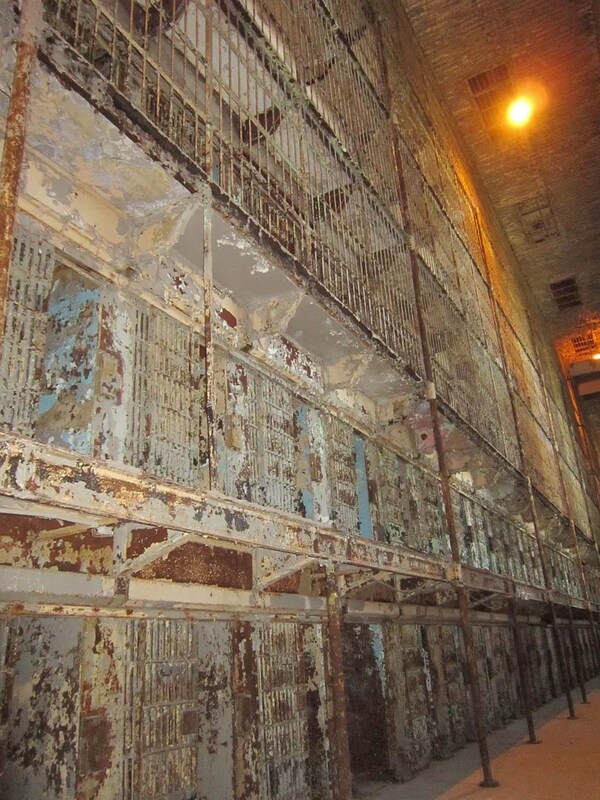 Even with the closures, OSR offers plenty of opportunity for wandering through its multi-story network of cell blocks. You still need to be careful, though. One false move, and your possessions and smaller party members go tumbling. I speak from experience here. After I took the above photo, I dropped my phone and watched it bounce off the catwalk and flip down to the next level below. The stairs thankfully led me in its direction, but I had to reach a wee bit unsafely past a Do-Not-Enter chain to retrieve it. Luckily for me the phone case did its job and protected it from a ruthless shattering. Looking up on the same scene from below was no less intimidating. Meanwhile, my wife did her thing with her own camera. Sweet and angelic as she is, given her clean record and all, this was a rare chance for her to examine life behind bars and get an idea of the fate that lay in store for all the perpetrators you see on those basic-cable true-crime shows. The purpose of some rooms was hard to discern even if you read the available signage. I forget which room this was, but the ravages of time speak harshly enough for themselves. 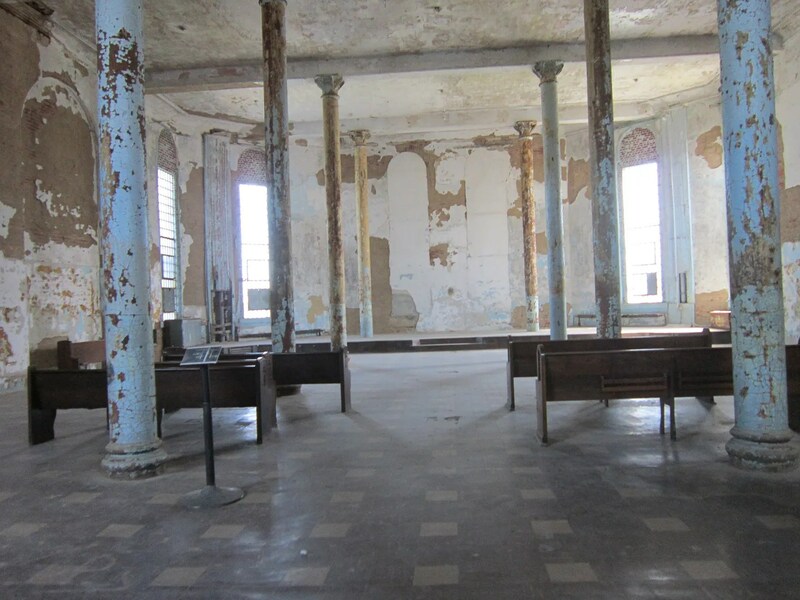 Once upon a time this was a prison chapel. It’s probably been ages since this room changed a life for the better. Even emptier: the prison library. A few tattered schoolbooks remained on display at the checkout a desk for visual effect, but closer examination revealed copyright dates that weren’t as vintage as one would expect. 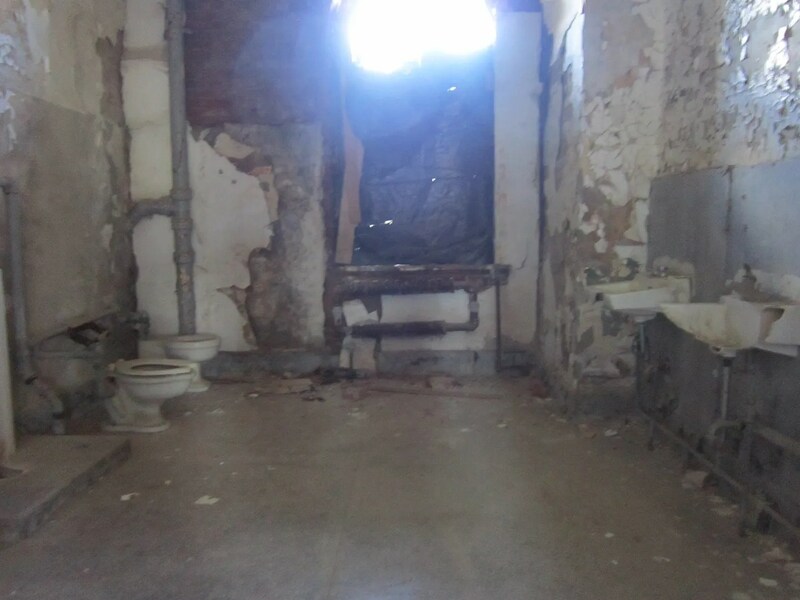 Time hasn’t made the bathrooms any more glamorous, either. 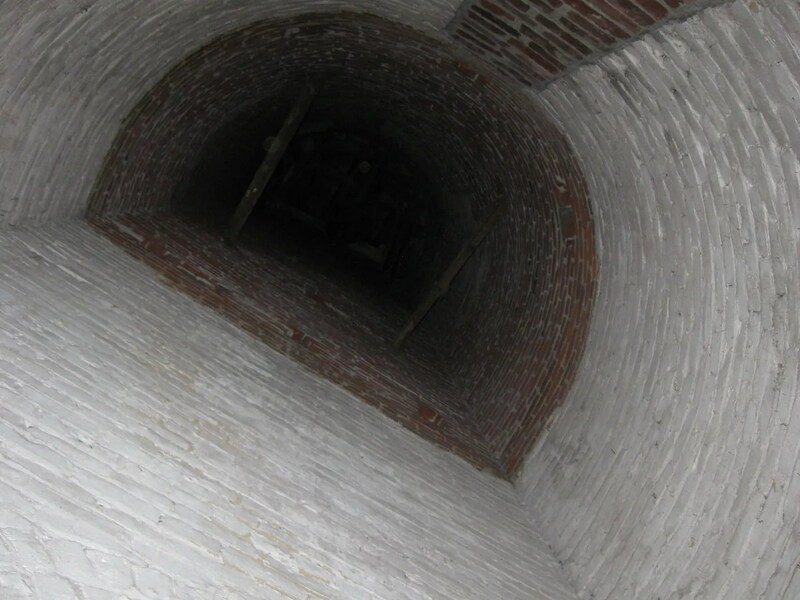 Some areas had closets, tunnels, and hidey-holes so pitch black that the only way to view their contents was to stick my arm into the abyss, snap a photo blindly, and check the results in the viewer. Alas, no sign of any hidden bodies or pirate treasure. Admittedly, it was an unusual choice for our final tourist attraction of our 2013 road trip, but it served as a collection of much-needed reminders for us to ponder over the final miles ahead. Foremost among those thoughts: don’t take the comfort, safety, cleanliness, and structural integrity of home for granted. To be continued. Coming soon: outtakes! « “Almost Human”: Almost Renewable? Thanks! 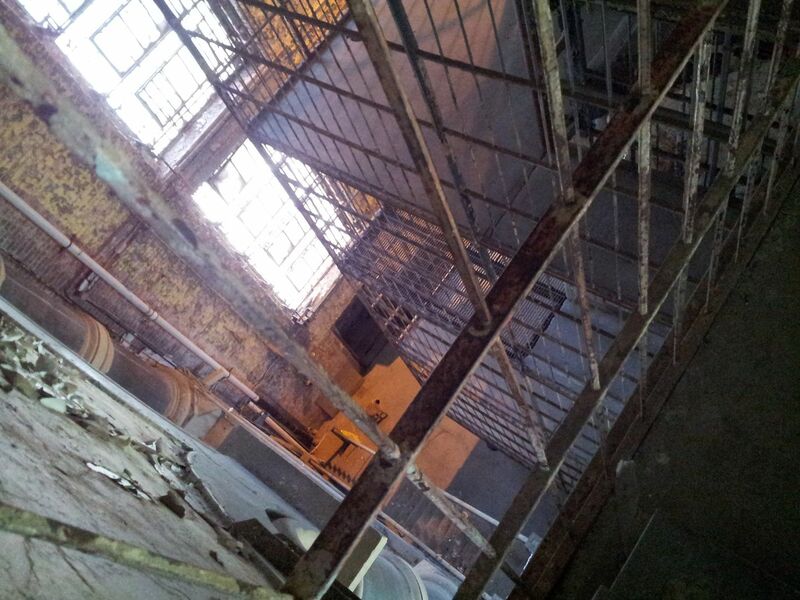 They showed more signs of (former) life than some of the other, emptier rooms. What an incredible structure. 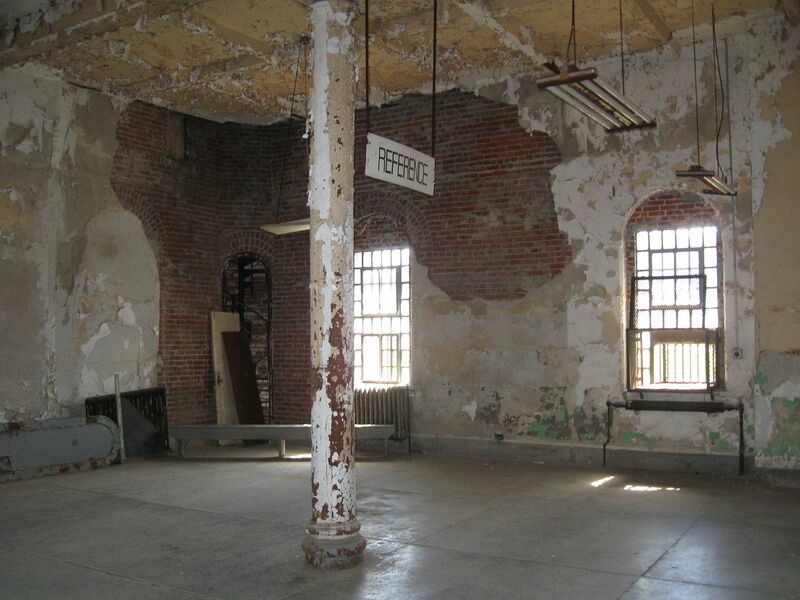 Too bad it isn’t being rehabbed for people who need a place to live. You visit the most unusual places. It’s great that you share them here. BTW, Randall, I didn’t unfollow you. I wondered why I wasn’t seeing your posts in my reader. So, I did a little investigating and discovered the “following” was unclicked. I know some other bloggers have had this mysterious experience too. Bizarre, but I am still reading. Huh. That’s not the first time I’ve heard about a case of spontaneous unFollowing. The readers are willing, but the tech is weak. So weird.